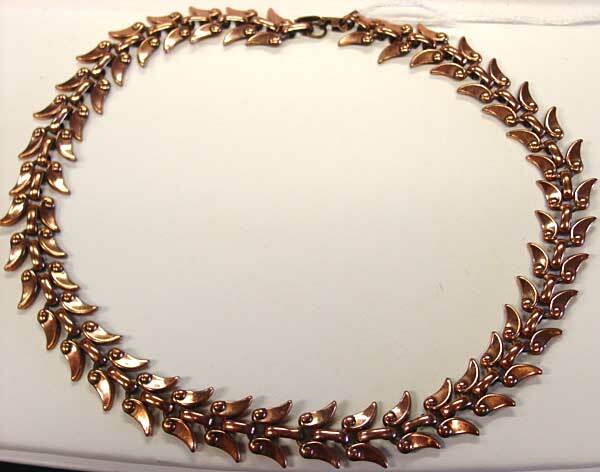 Copper jewelry was very popular in the 1950's, being made by a number of manufacturers whom we don't normally associate with copper jewelry. 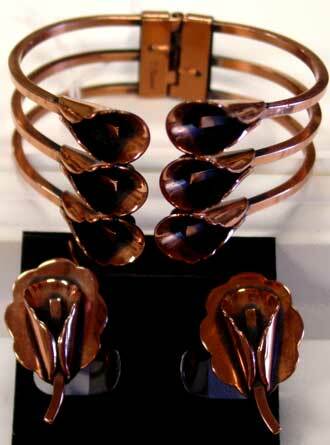 However, the most collectable pieces of copper today were made by companies that specialized in copper jewelry, namely Rebajes and Renoir. 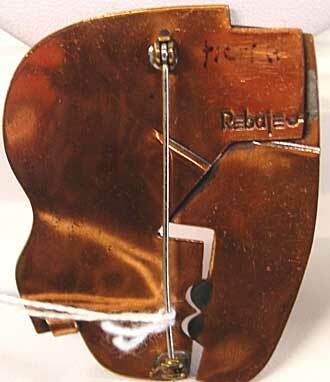 Rebajes is less common than Renoir and was designed by Frank (Francisco) Rebajes, a NYC artist of Spanish descent who apparently started with junk metal and eventually turned to copper as his chosen medium. 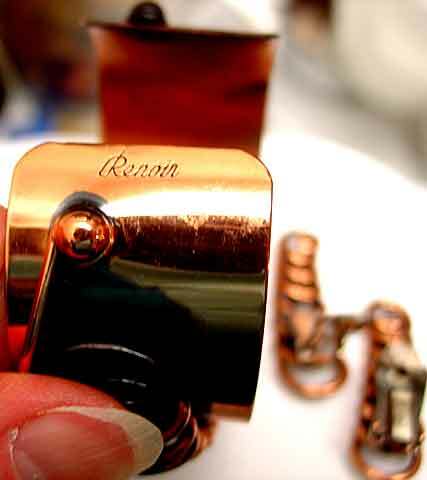 Renoir was manufactured in California by Jerry Fels and his partners, and this prolific company made Renoir (copper without enamel), Matisse (copper with enamel) and much less often found Sauterne, a sterling silver line. 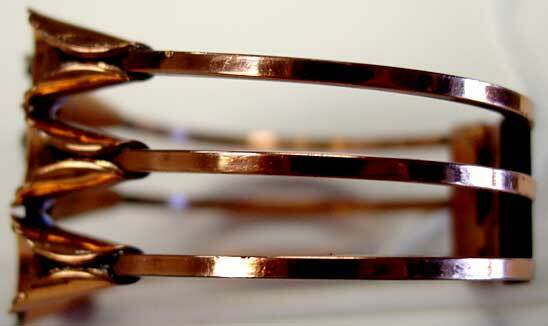 Other less well known companies also specialized in copper. 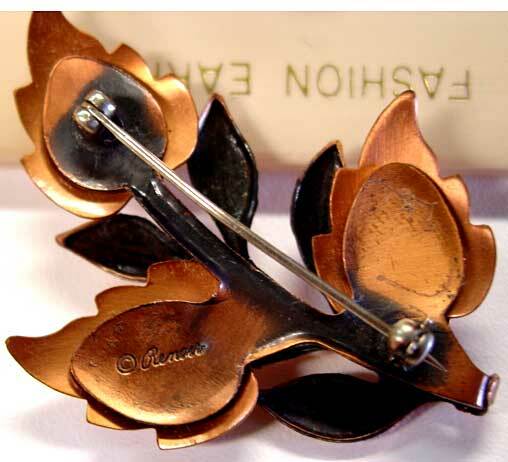 The choice of a Beatnik generation, these pieces were the flip side for people for whom glitzy rhinestone didn't appeal. Questions? Problems? Contact me @ ppj@ncn.net or by calling 515 882-3492. Thank you! 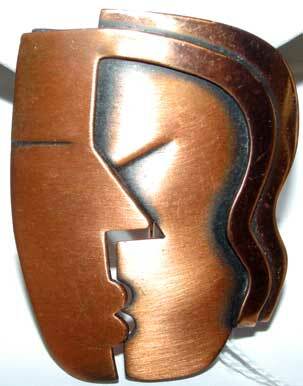 Description: Rebajes "The Kiss" Brooch - Well known Rebajes pieces, this is NOT one of the contemporary re-issues of this piece. Excellent condition, with a tiny bit of scratching on the lower part of the man's face. Someone has written on the back with a felt tip pen in the top right hand corner. 2 1/4" x 1 7/8", slightly curved. Description: Matisse Impressionistic Bracelet and Earrings Set - Presumably pieces of Matisse that do not have a copyright symbol with the signature predate 1954. 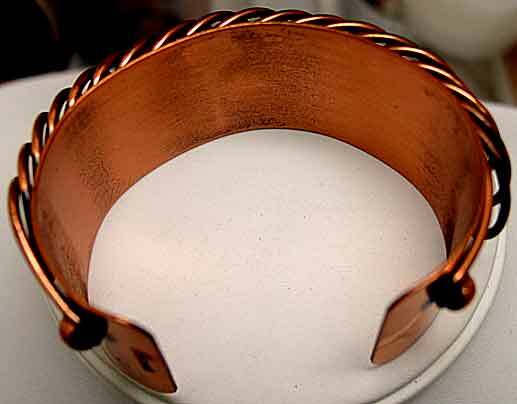 A very similar bracelet is shown in Copper Jewelry: A Different Lustre and said to be one of these pieces, and indeed, the earrings are signed with no copyright symbol. 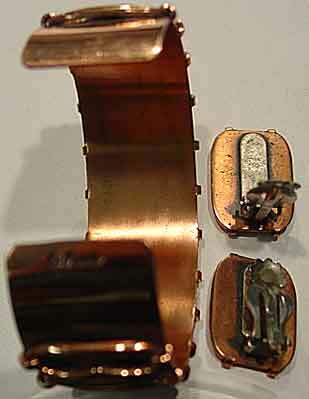 This set shows some signs of wear - the copper on some of the rectangular pieces is worn and appears to be a long-ago done enamel repair on one of the bracelet links. Bracelet is 7" including foldover clasp, and 1 1/8" wide; clip earrings are 1" x 3/4". 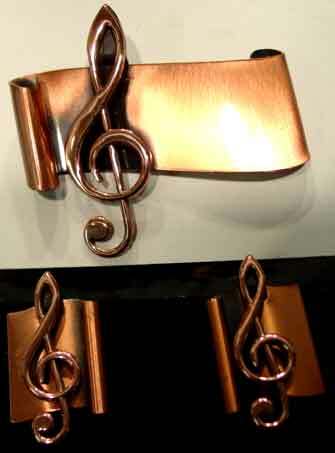 Description: Renoir "Etude" Treble Clef Copper Brooch and Ear Set - Music was important to the beatnik generation; here we have treble clef sign earrings and brooch set. Brooch is 2 1/4" x 2 1/8", earrings are clip, 1 1/4" x 3/4". Beautiful condition in a hard to find set. The Matisse line also used this design in an enameled version, in at least 2-3 color variations. 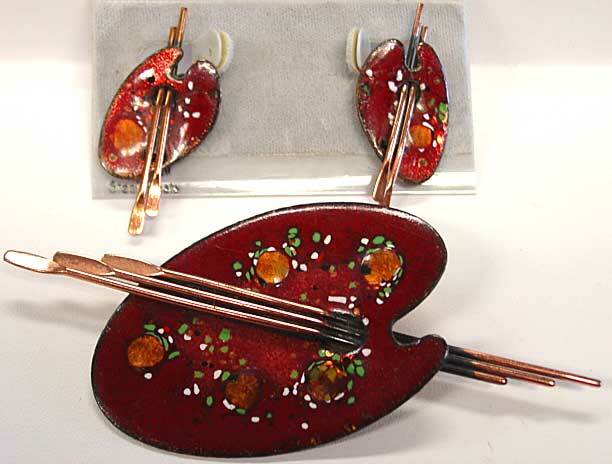 Description: Matisse Palette Brooch and Earrings in Red - One of Renoir-Matisse's best known designs, here in red, brooch and matching clip earrings. 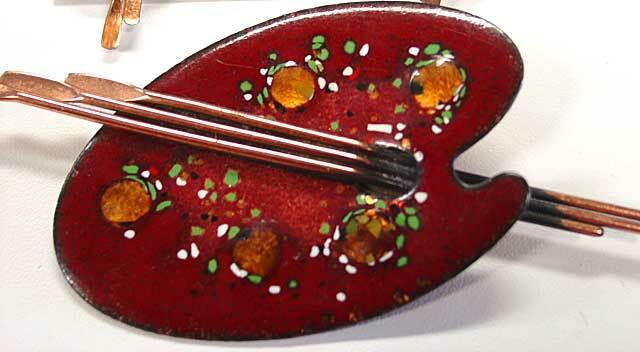 Brooch is 4 1/4" x 2", earrings are 1 3/4" x 3/4". Excellent condition, with one earring having a little loss of the clear protective coating in one spot. 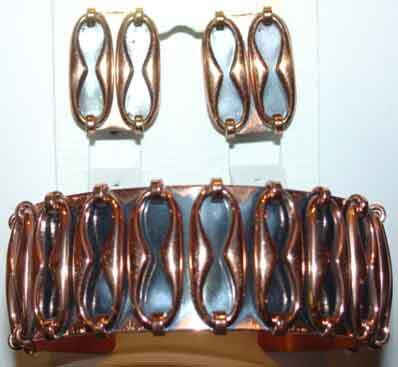 Description: Renoir Spiral Copper Earrings - Spiral heavy copper wire was a popular design element for Renoir (please see XS1-134); these use a double spiral on either side of a triple band of the same wire, in a domed, rectangular shaped earring. 7/8" x 11/16", clip finding, excellent condition with some signs of mild wear on the clip finding. 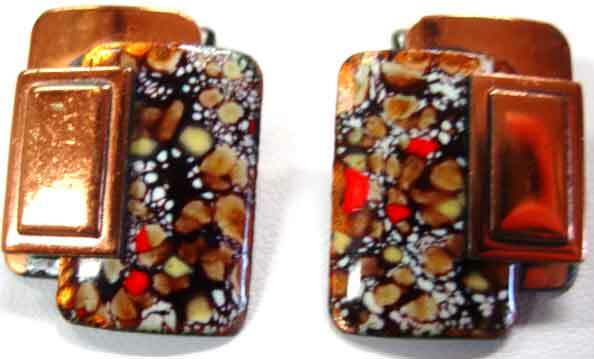 Description: Matisse Enameled Squares Earrings - Red and grey enameling is topped with a copper square going at 45 degree angles. 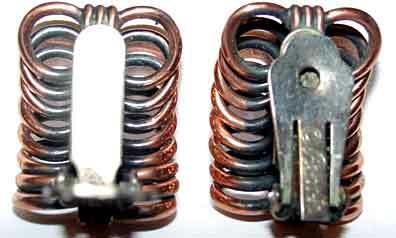 Clip, 7/8". 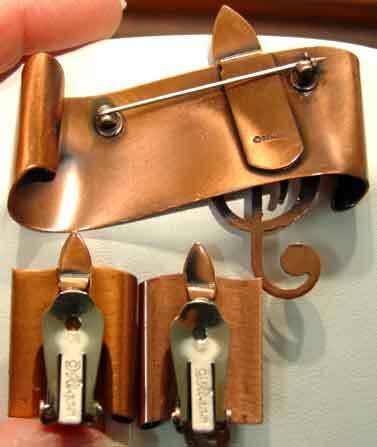 Copper seems to have almost a brushed finish; I have not seen any pieces done this way and am not sure that it is original to the piece, but were this way when I purchased them. Otherwise excellent condition. Description: Renoir Choker Length Link Necklace - Lots of small links make this necklace fit nicely, styling is classic and can go with lots of casual clothing as well as dressier daywear. 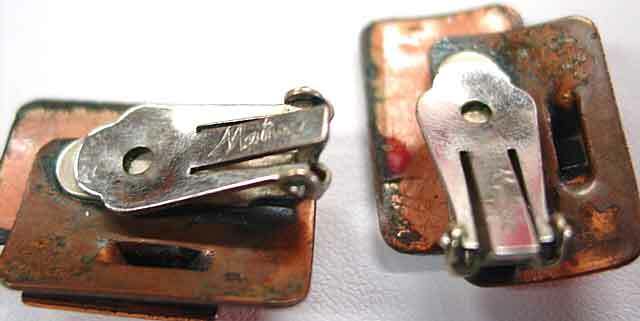 Excellent condition, only real signs of wear are on the foldover clasp where it must have rubbed when worn. 16" x 1/2". 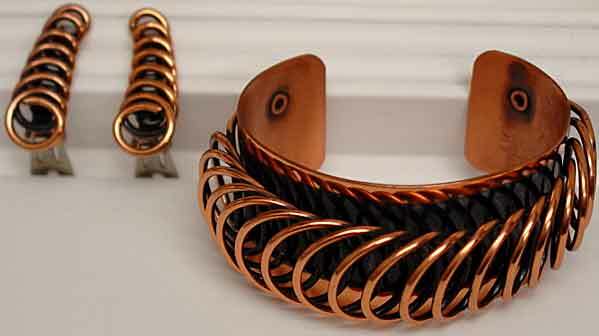 Description: Renoir Copper Coil Cuff Bracelet and Clip Earrings - Excellent condition with little exterior scratching and minor interior wear. All pieces sign. Cuff is 1 1/4" wide; earrings are 1 1/4" x 1/2". 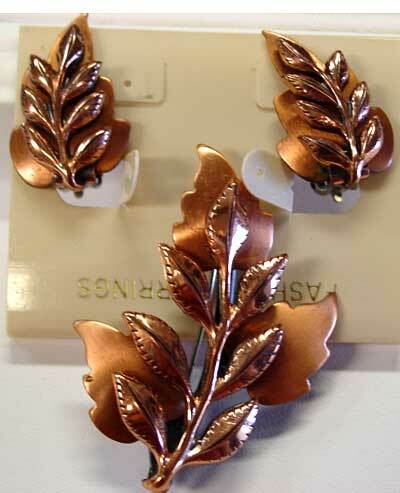 Description: Renoir Laurel Brooch and Earrings Set - Nice contrast of shiny and matte finished copper in this layered design. Brooch is 2" x 1 1/2", clip earrings are 1 1/8" x 3/4". Excellent condition. 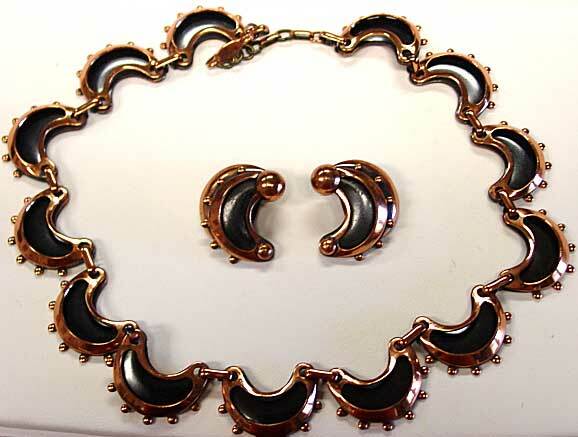 Description: Renoir Crescent Moon Necklace and Earrings - These use an inset area that is oxidized? enameled? black, with the copper portion acting as a frame for the general design, with various sized hobnails added for interest. Necklace is a link style with adjustable hook closure; unfortunately the previous owner somehow pulled on the extension chain and must have broken off part of the tail; I have no copper tail to replace it but did add a few brass jump rings so that it is a wearable length, 15 1/4" x 3/4". 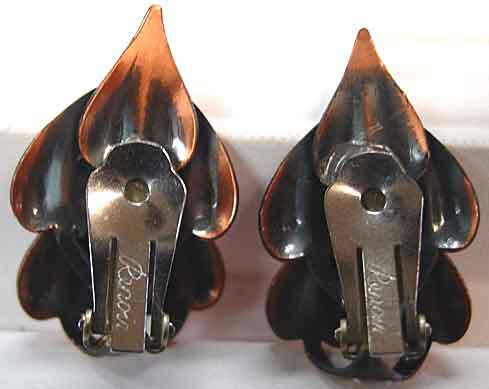 Clip earrings are 15/16" x 13/16". Almost no sign of wear on the exterior, though there is the usual pitting on the inner clip finding where it would have touched the skin. 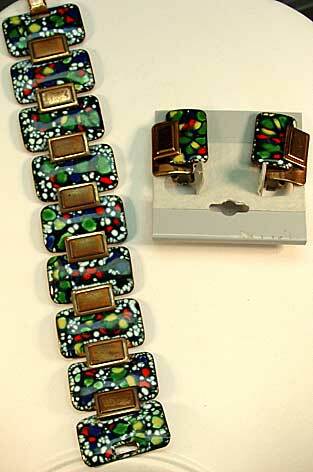 Description: Renoir Bar Bracelet and Earrings Set - I'm not sure what the original name for this pattern was. 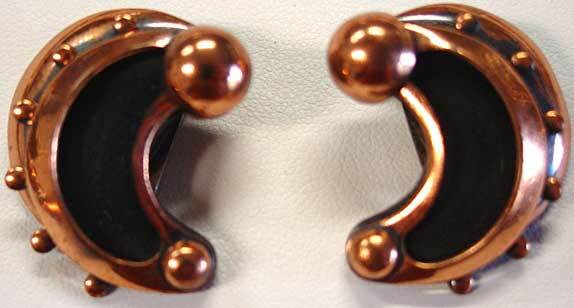 Clip earrings are about 1 1/4" x 3/4"; very heavy link style bracelet with foldover clasp is about 1" x 7 1/4". 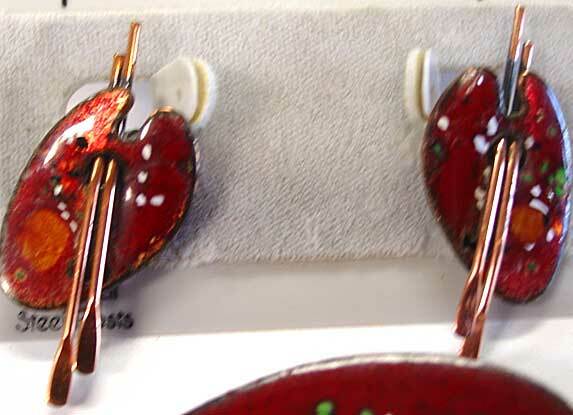 Earrings are in good shape, with one earring more worn than the other, better one has minimal light scratching, other has more scratching and a few small pits. 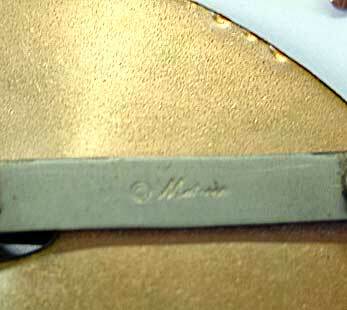 The bracelet is quite worn with obvious scratching that you can probably see in the photo. Ordinarily I wouldn't offer anything this worn, however this bracelet fits well because of its many links and feels great to wear because of it's heft, so if you don't have to have pristine this is a nice bargain for you. I have had this as a necklace and earring set, so perhaps it is time to have the matching bracelet and an extra set of earrings! Description: Renoir Blossom Hinged Bangle and Screwback Earrings Set - This is sometimes referred to as Cally Lillies but Renoir's actual name was Blossom. Hinged bangle has three lines that culminate with the floral ends on each side, with the same floral heads used in the earrings but with a scalloped back. 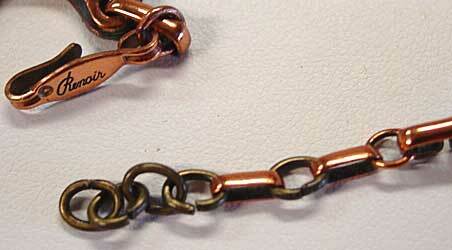 Bracelet is 1 1/4" wide at center front, 2" x 2 1/4", screwback earrings are 1 1/4" x 3/4". Excellent condition with just a very tiny bit of play in the bracelet. 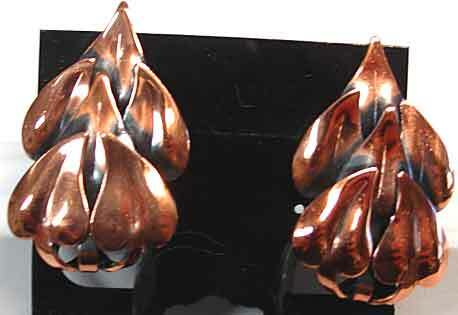 Description: Renoir Heart-shaped Leaf Copper Earrings - I am sorry to say that I do not know the pattern name for these, and indeed, I have never seen this pattern before. 1.5" x 7/8", excellent condition, with usual clip mechanisms signed Renoir. 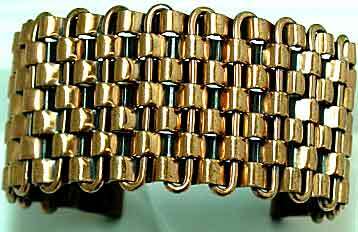 Description: Renoir Basketweave Bracelet - One of Renoir's most sought after designs. 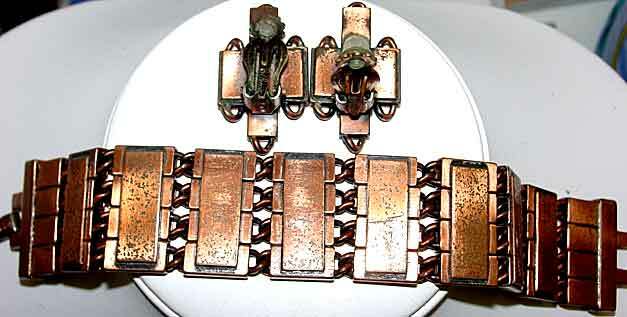 1 1/4" wide cuff bracelet, will fit most wrist sizes. Very good condition with little sign of wear on top, more wear visible at the back where it would rub on table tops, etc. Inside is somewhat worn - must have been a beloved piece for the original owner. Description: Matisse Olive Green Maple Leaf Earrings - 1 1/8" x 7/8" approximately, clip findings signed Matisse. Olive green enamel with darker green or black accents around symmetrical edges. One small 1/8" straight line crack on left earring near end of point between the two copper dots, no loss of enamel, copper is in good shape.